The "Circle Tool" is used for creating new circle layers. Click where you want the center of the circle to be, and drag to set the radius. 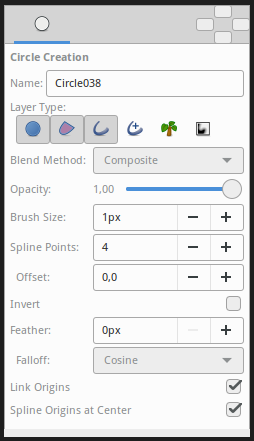 The "Circle tool" can also be used to create outline layers, region layers, curve gradient layers, and plant layers, each with approximately circular Splines. Click on the canvas where you want to have the center of the circle and drag to obtain the desired radius value, and release the mouse button when you are done. This page was last modified on 7 March 2016, at 18:58.